Click any photo below to see all of the items in that category. 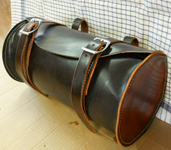 Quality leather horse saddlebags and pommel bags made to last. Nothing looks as classy as leather on the trail or downtown in a parade! Horse Saddlebags make a great gift for the horse lover, home decor gift for that western look and even hung over the seat of a 4 wheeler. 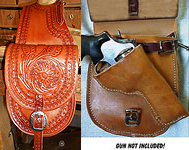 We can customize your horse saddlebags or pommel bags to fit your wood post horn, pack a pistol, add your ranch brand or name or match your saddle. Made in the U.S.A.